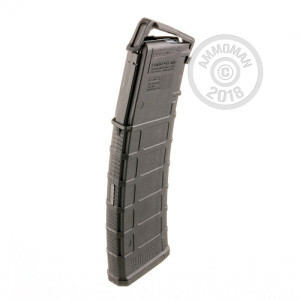 This 40 round PMAG Gen M3 magazine by Magpul is compatible with both 223 Rem and 5.56x45 caliber AR-15 and M4 weapons, as well as others including the HK416, SA80, and SCAR MK16. 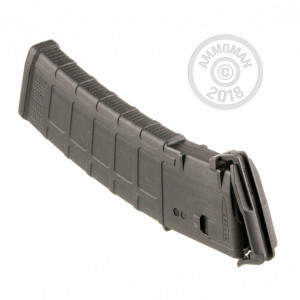 Its crush resistant polymer construction means that this magazine will withstand wear and tear in even the most rugged environments, and its constant curve internal geometry always assures smooth feeding. This magazine additionally offers a durable and long-lasting stainless steel spring, anti-tilt and self-lubricating follower, over-travel insertion stop, and pop-off dust cover that keeps dirt and debris from contaminating your cartridges. This magazine is easy to handle courtesy of its ribbed gripping surface and heavily textured front and rear, and its flared floorplate further facilitates handling while at the same time aiding in disassembly. Thanks to its paint pen dot matrix panels this magazine is easy to personalize, a great feature for anyone whose friend has mistakenly grabbed one of their better accessories during a shoot together at the range.